Catarina Paone, NP graduated from Hartwick College in Oneonta, NY with her BSN in 1992. At graduation she received the United States Air Force award for nursing leadership. Her Baccalaureate Research project was on Passive Smoking and the Incidence of Respiratory Distress in Children Ages 5-15, conducted at Seattle Children’s Hospital. She began her nursing career at St. Peter’s Hospital in Albany, NY on the cardiology unit after having been in the nurse extern program at St. Peter’s during her four years at Hartwick. While working as a staff nurse, she participated in several nursing education activities for the evolving cardiac program, including the hospitals first electrophysiology studies, ICD implants and coronary stents. She was often in charge of the unit on the evening shift. Catarina developed several cardiac nursing protocols on cardiac medications, arrhythmia management, discharge instructions, nutrition and patient exposure to radio frequency during ablations for St. Peter’s Hospital. She also worked in the hospital’s outpatient cardiac infusion center for the heart failure patients. Following Catarina’s graduation from Hartwick College, she continued to work at St. Peter’s Hospital on the cardiology unit while pursuing her Masters in Medical/Surgical Nursing Education and Clinical Nurse specialist at Russell Sage College. Upon completing these degrees, she accepted an adjunct faculty position at Maria College. Catarina taught for four years, while continuing to work at St. Peter’s Hospital and Kaiser Permanente setting up a home based cardiac rehabilitation. During that time she went back to school to get a post master’s certificate in Adult Nurse Practitioner at Sage. 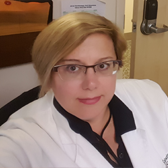 While working on this degree, she expanded her experience in cardiology nursing by working in a private cardiology practice in their stress testing lab. Her Master’s project was on the Examination of Stressors in Patient’s Undergoing Electrophysiology Studies. Catarina joined Capital Cardiology Associates in January 2001 as the company’s St. Peter’s based nurse practitioner. While she has worked as an NP, she has continued to mentor and precept many BSN and MSN nursing students as well as served on committees at St. Peter’s to develop their computerized physician order entry system. She has given talks to their Heart Failure support group and has presented heart failure to the new graduate nurses of the cardiac units. Catarina is a member of Sigma Theta Tau at Hartwick College and the NYS Nurse Practitioner Association. She has completed the Gladstone Institute of Lipid Disorders Minifellowship and Tikosyn Education Distribution program. She is certified through the American Nurse’s Credential Center. In her spare time, Catarina enjoys spending time with her family and friends, as well as with her basset hound, Francesca. She volunteers for Wreaths Across America and has been a confirmation sponsor and taught religion at her church. She enjoys traveling to Florida, photographing sunsets, biking and gardening.